Feng Mengbo is an artist. 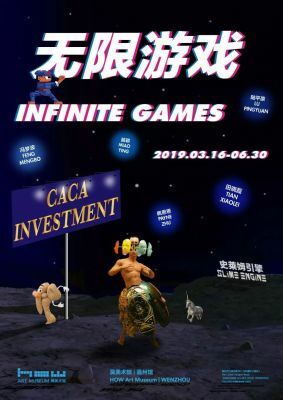 HOW Art Museum (Wenzhou) is pleased to announce that it will hold the exhibition Infinite Games from March 16th to June 30th, 2019. Since the beginning of ancient intelligentsia, “games” have referred to the recreational and non-productive activities of human beings. It’s precisely this sort of “play” which has resulted in an inadequate distinction between human society and culture. Games take up a large part of peoples ideal time after work. Up until now, the narrow notion of games has been centered around invasive network-based games, with their development of toys, RPGs, and the extensive as well as pervasive VR technology, to create a whole new world juxtapositioned and in accordance with reality. This new virtual world fills the gaps and shortcomings of reality while providing participants with clear goals and rules, a sense of purpose and accomplishment, not to mention a very enticing internal feedback mechanism. With the hundreds of millions of people immersed in the virtual world, there is a large amount of capital at work. This sort of operation has become a powerful force, affecting the realms of entertainment and culture as a whole. Moving from “Game” to the represented "Play-Element" of culture, the exhibition Infinite Games will be composed by artists Feng Mengbo, Lu Pingyuan, Miao Ying, Tian Xiaolei, Payne Zhu and their creations within the contemporary art space "Slime Engine” where they present and discuss the impact and role of the game and the virtual world in contemporary art.